Kainos Print offers a comprehensive suite of stationery products. We offer A4 letterhead, A4 letterhead with DL envelopes, two sizes of ‘with compliments’ slips and business cards. All stationery is supplied unfolded. Here is a list of what we offer on this web site. You can click on any of the products listed to go straight to the product page. We think our products speak louder than our words ever could. We have prepared a sample pack that contains a representative choice of the products we offer, printed on different stocks, and showing various coating options. Fill out our samples request form, and we’ll send you our free sample pack. Click here to go to our samples request form. Our A4 letterhead is printed in full colour on one side only on smooth, high quality, high white 90gsm uncoated paper. In addition to letterhead, you can choose to ask for letterhead and high quality 100gsm blue lined ‘peel and seal’ security (220x110mm) DL envelopes. Envelopes are supplied unprinted. 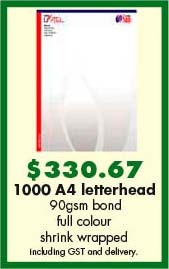 We do not offer digitally printed quantities of letterhead. Most letterhead is intended for printing through a laser printer. There is a risk that the toner, which is used in place of ink in digitally printed materials, will melt and harm your laser printer. In order to offer our super competitive letterhead prices, we may sometimes have to take more than five days to print them — which will enable us to print a number of letterhead orders at once to keep the price low. We will not take any longer than ten working days. We offer two sizes of ‘with compliments’ slips — 99x210mm DL and 148x210mm A5. ‘With compliments’ slips are printed on one side only on smooth, high quality, high white, 90gsm uncoated stock. We have not placed the same quantity restrictions on ‘with compliments’ slips, which are available in all quantities. We offer business cards in the common 55x90mm format. They can be either landscape, which is the usual format, or portrait. They can be printed on both sides or one side only. The front is always in full colour, but the reverse can be full colour, black and white only, or blank. We print business cards on your choice of three heavy cards stocks — 300gsm satin, 300gsm gloss, or 310gsm uncoated stock. The uncoated stock is the paper of choice if you need to write on your business cards. You can have business cards in a smaller size than 55x90mm if you wish, but the price will be the same. Simply proceed with your order as normal, and tell us in the comments box the final size you require — and of course set your cards up appropriately. It is important that you set your business cards up correctly. Please click here to see our business cards hints and tips page. Wherever possible we offer to print more than one design for the cost of the total number ordered. For instance, you could order 250 each of two different designs of A4 letterhead, and pay the 500 A4 letterhead rate. Our capacity to offer this benefit has some limitations, based on the presses we use. These limitations are explained below. A4 letterhead. You can have equal quantities of two designs of A4 letterhead. DL ‘with compliments’ slips. You can have up to six different designs in any combination (quantities do not have to be equal), provided the total does not exceed 2500. For quantities over 2500, you can have equal numbers of six designs. A5 ‘with compliments’ slips. You can have up to five different designs in any combination (quantities do not have to be equal), provided the total does not exceed 2000 pieces. For quantities over 2000 you can have equal quantities of four single pieces. You can have up to ten different names on your business cards for the cost of the total number of cards. For example, you could order 500 cards, and have 125 each of two names, and 250 of another name and you would pay the 500 card rate. You could order 1000 business cards, and have 100 each of ten different names, and you would pay the 1000 card rate. If you don’t have the time, the confidence, the ability or the software to design your own stationery, Kainos Print offers a top flight design service. We use a highly experienced designer, Dragan Djuric, who has done a considerable amount of excellent design work over many years for Kainos Print staff members. You can see Dragan’s design portfolio for yourself by clicking here. Our design rates are extremely competitive, and our turnaround is extremely fast. You will find instructions for using our design service and indicative pricing when you visit Dragan’s portfolio page.